I’ve missed the 230th anniversary of John, Second Earl of Chatham’s wedding to Mary Elizabeth Townshend by five days, but never mind. 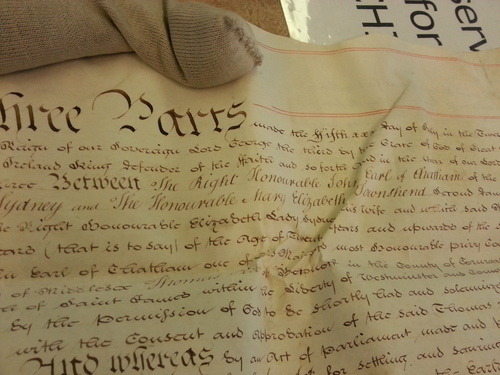 A couple of weeks ago I had the opportunity to visit Bromley Archives and check out the marriage settlement drawn up for them and signed by all parties on 5 July 1783 (the marriage took place five days later). In a nutshell, the settlement designates various sums of money which, together, make a larger sum intended to purchase of stocks on behalf of any younger children born of the marriage. This was two sums of £1000 (an inheritance left to Mary by a relative, and a similar sum of money left to her sister Georgiana, who signed it over), to form a dowry of £2000; plus a little over £3000 expressly set aside to plump up the sum. Lucky John: that was quite a dowry, although John wasn’t allowed to touch the £2000 as it was intended to be Mary’s “pin money” and therefore belonged to her (in the words of the legal text, “for her own separate and peculiar use in the nature of pin money and exclusively of the said John Earl of Chatham who is not to interfere or intermeddle therewith nor is the same or any part thereof to be exposed subject or liable to his debts controul or interference”: get told John!). The eldest child of the marriage, obviously, stood to inherit the £4000 pension settled by Parliament on John and his mother for four lives in memory of his father William Pitt (the Elder), First Earl of Chatham. John was second in line to receive the pension after his mother, and his eldest son (had he had one … which he didn’t) would have been third. The £4000 pension was also meant to provide for Mary’s jointure of £1000, to be paid out annually in quarterly instalments should John predecease her. The contract (all ten whopping vellum pages of it) was signed by the bridegroom, the bride, the prospective father-in-law, and four trustees (two on the bridegroom’s side and two on the bride’s), who agreed to make sure the terms were adhered to, and basically to stop John running off with the money intended to provide for his wife and children in case of his early death. The trustees in question were John’s brother William Pitt the Younger, who had just finished a stint as Chancellor of the Exchequer and was yet to become Prime Minister; John’s first cousin Thomas Pitt, later Lord Camelford; Mary’s uncle Charles Townshend; and Mary’s cousin Thomas Brodrick. We know Mary’s father, Lord Sydney, was a wealthy man (his biographer, Andrew Tink, in Lord Sydney: the life and times of Tommy Townshend (Melbourne, 2011, p. 150). The settlement certainly bears that out. John was … less wealthy, and I imagine the £5000 sum made a sucking sound as it entered his bank account and then, instantly, left it again. I did wonder if drawing up a marriage settlement contract was, in fact, a reflection of John’s impoverished status— Lord Sydney pretty much saying “OK, you can marry my daughter, but only if you pledge to be sensible with the money I’m giving her!” I was therefore happy to find that marriage settlements were de rigeur in aristocratic families with money and property to pass on. According to H.J. Habbakuk in “Marriage settlements in the 18th century” (Transactions of the Royal Historical Society, 4th series, 32 (1950), 15), the settlement was intended to limit “the interest in the estate of the father of the husband and, after him, of the husband himself, to that of a life-tenant, and entailing the estate on the eldest son to be born of the marriage”. This is especially interesting because John’s estate is not mentioned at all in the settlement: the only thing that is mentioned is that the title is to descend down the male line, and that the £4000 pension will go with it. In 1783 John had two estates— Hayes Place, in Kent, and Burton Pynsent, in Somerset, which according to the provisions of his father’s will he held jointly with his mother. Neither estate is mentioned in the contract. Hayes and Burton came with very little land, comparatively speaking— although Burton at least had a farm, which brought in some income— but they were both mortgaged (and in the case of Hayes at least, remortgaged) to the hilt, which may be why they were not mentioned. John sold Hayes two years later in any case: perhaps he had already intended to do so in 1783, which is why it is not included in the settlement. This may also be why Sydney stipulated the enormous sum of £1000 to be set aside for Mary’s jointure. One last interesting fact: Mary was under the age of twenty-one when she married John (her birthday was in September). 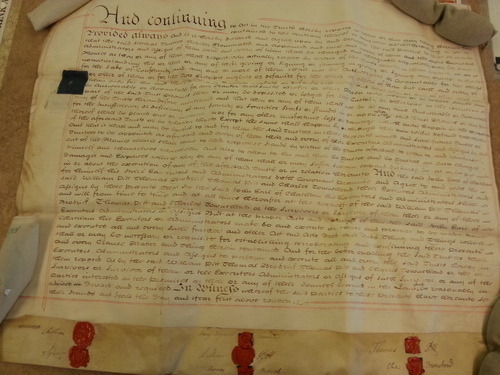 The contract therefore notes that “the said Mary Elizabeth Townshend is now an Infant under the Age of Twenty one Years (that is to say) of the Age of Twenty years and upwards of the second part”. I’m not sure what I would have thought if I were referred to as an “infant”! (Not to mention the fact it makes John look like an absolute cradle-snatcher!) Sydney, by signing the contract, gave his permission for his daughter to marry even though by law she was under-age. 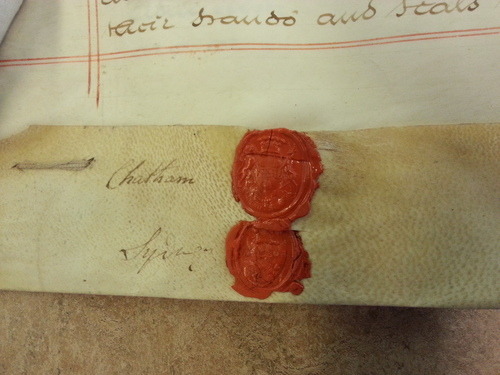 This entry was posted in Uncategorized and tagged 2nd earl of chatham, eighteenth century, john earl of chatham, john pitt earl of chatham, lord sydney, marriage settlements, mary elizabeth countess of chatham, mary elizabeth townshend, pitt the younger, second earl of chatham, the younger pitt, thomas townshend lord sydney, viscount sydney, william pitt, William Pitt The Younger. Bookmark the permalink.